Oops, I did it again. I bought more asparagus. Hey, what can I say. I can’t resist a deal and once Summer is gone, so are the asparagus savings and I’ll be sad again. Maybe that’s exaggerating things a bit. I’m sure there will be a Fall veggie to takes its place at that point and I’ll forget about asparagus until next year. For some reason, The Kid does not like meatballs. She likes hamburgers, steak, and other beef items. As she puts it, she does not like “any kind of meat in ball form.” I tried to point out that a hamburger was merely a meatball smashed flat into a circle and it was still a no go for her. However when I was making this recipe, she came in from the other room to see what was up and commented that it smelled like a great Italian restaurant in the kitchen. Bring a pot of water to a boil and prepare the orzo or other pasta according to package directions. I boiled mine for 8 minutes. Meanwhile preheat your oven to 425 degrees. Mince the onion and garlic, and place in a large bowl. Roughly chop the pine nuts. I just gave them a few quick chops with my knife to break them into smaller pieces. Pine nuts are small as it is so you don’t need to go overboard. Add them to the bowl. Chop the parsley and add half of it to the bowl along with the bread crumbs, tomato paste, cumin, egg and beef. Mix well. I squeezed it with my hands to make sure everything was well blended. Form the mixture into 16 meatballs that are about an inch across. Place the meatballs on a cookie sheet lined with foil and bake at 425 degrees for 15 minutes. While the meatballs are cooking, cut the asparagus into 1/2 inch pieces and heat a pan over medium heat. Saute the asparagus for about 7 – 8 minutes until tender. If you like, add a little water to steam them slightly and speed the cooking time. You don’t need a lot of water for this. A quarter cup or so is plenty. When the asparagus is done, remove from heat. Drain the orzo or pasta and place in a large bowl, add the asparagus and remaining parsley and toss. Squeeze the lemon over top to season with the juice and salt and pepper if desired. Remove the meatballs from the oven and let them cool about 5 minutes. 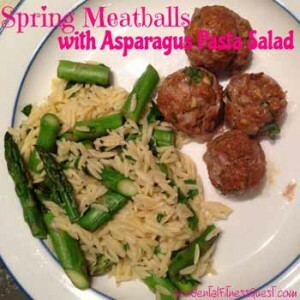 Divide the pasta and asparagus mixture evenly among 4 plates and add 4 meatballs to each. Makes 4 servings at approximately 361 calories each – 26g protein, 45g carbs, and 11g fat. Another great small pasta is ditali which are tiny little tubes that would be perfect in this recipe. You could also go very kid friendly and give alphabet noodles a try. Now that would be cute! I used 96/4 lean ground beef but any kind will do. You could even try ground chicken or turkey if you prefer that. Green beans would be a nice alternative to the asparagus in the off season, or potentially broccoli. The Kid really seemed to enjoy the meatballs despite her prior proclamation against them. I loved the flavors of the entire dish and liked that it really didn’t take much effort or time to throw together. If you’re looking for another asparagus dish, give the pasta with asparagus and peas in a creamy bacon sauce a try.